On the Wednesday before the race, I went out for my very last run in Southern California in the training cycle for this race. I kept my run intervals to what I’d be doing during the race…run 30, walk 90. 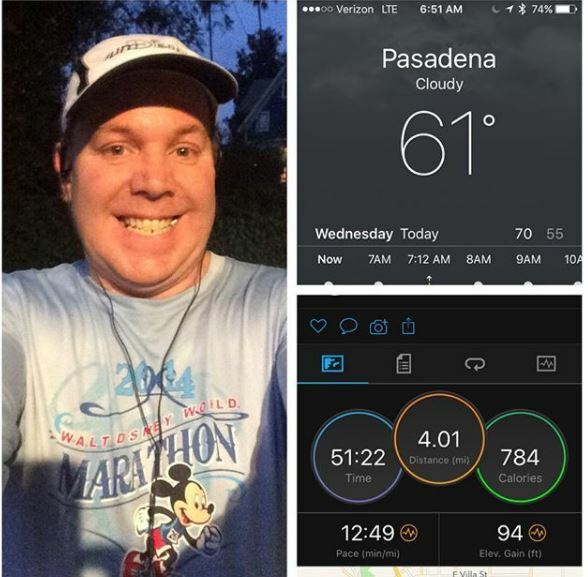 It was also my last planned 4 mile training run until I can run a 5K without stopping. Here’s what the splits looked like. Honestly, there was nothing about this run that went wrong. This is the run I wanted as the last one before heading out to the NYC. It was comfortable with my pacing the entire way. As I ran this route, I thought a lot about how this would be the last time I’d be running it for a while. I think the earliest I could see myself running over this route again is May of next year. So, I thought back to some of my runs over this route as I went along. It was a good time of remembering some of the good moments and some of the bad. At the end, I was ready to head off to the NYC! Even though it was technically a race, I took the Abbott Dash to the Finish 5K as my last training run. I used the same run/walk intervals as I’d use race day. However, I did also stop along the way for some pics. You’ll get to see those when I write up the race recap. The sad part is that I forgot to stop my watch until a little bit after finishing the race. After all, I finished the 3rd mile at 37:07. I doubt that the last 0.1 miles took me 13:21. If you’ve never heard of the Abbott Dash to the Finish 5K race, you should look into it. 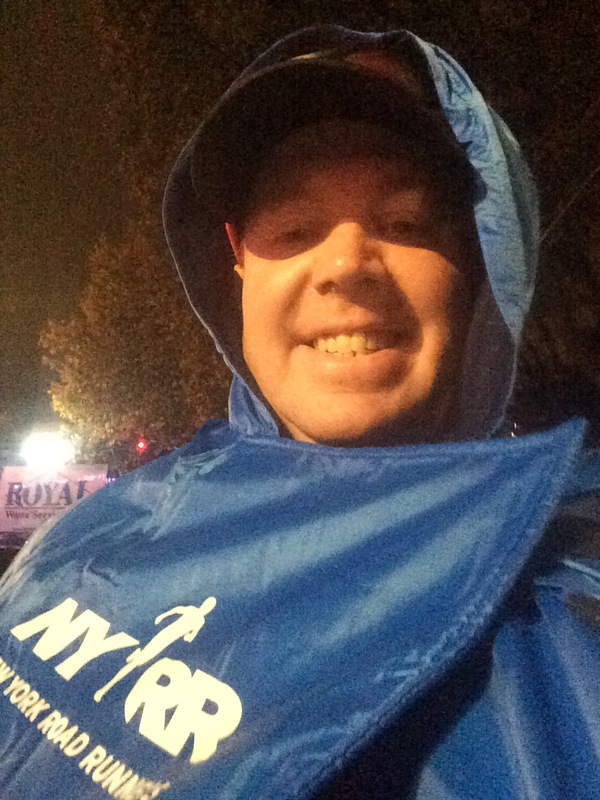 After all, if you can’t get into the NYC Marathon through the lottery and don’t want to do the charity thing, you could sign up for this race and finish in the same spot as the marathon finishes. It’s a totally fun run! There were around 10,000 people running the race. Before I post the recap, I’ll have to find what my official finish time was for this race. 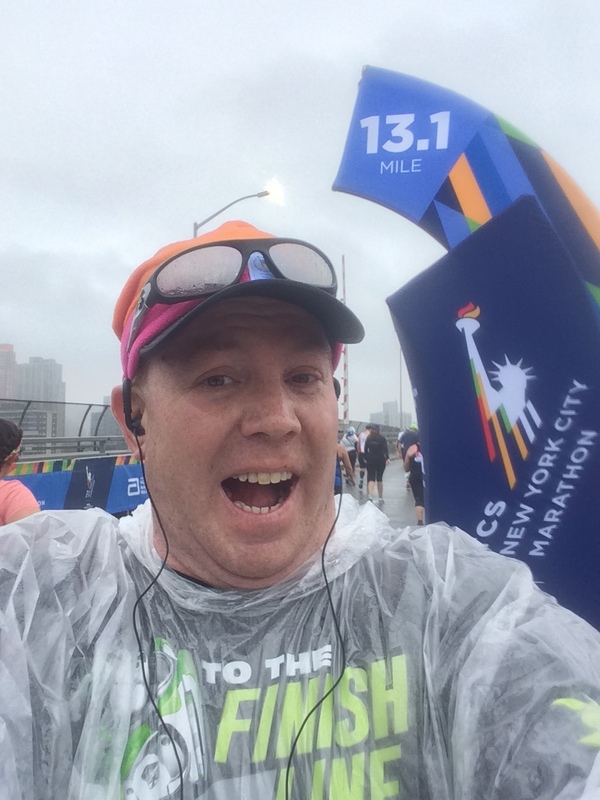 All of that lead up to the big day on Sunday, November 5, 2017 where I ran, and finished, the 2017 TCS NYC Marathon! The temps were pretty much perfect for running. It’s a shame that there was an on and off drizzle the entire race. Fortunately, it was off for the last few miles (for me). 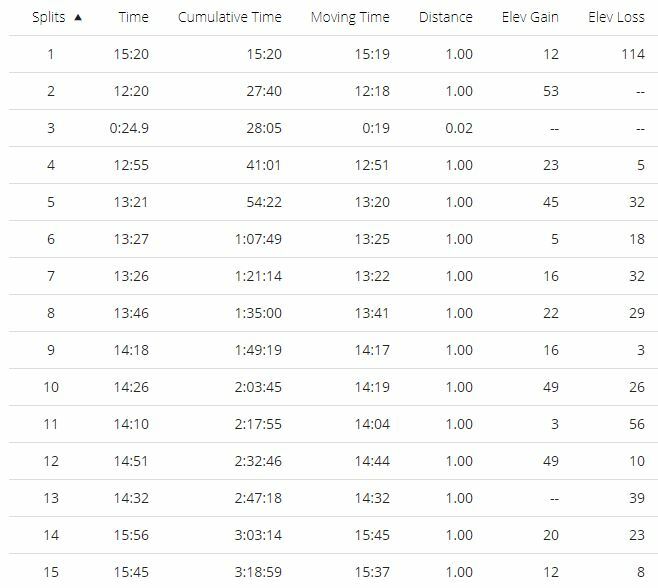 Here are the splits for the first 14 miles. (I know it says 15 splits. 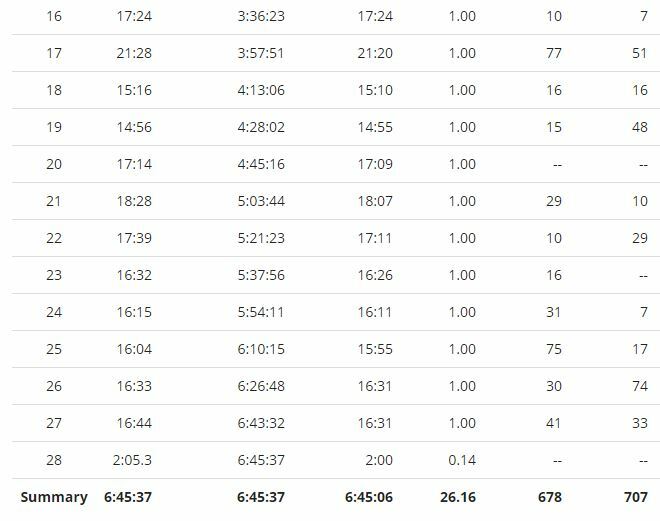 I accidentally caused a short split after mile 2) What’s funny is how the Garmin changed from being behind the mile markers on course, to being ahead of the mile markers, and then back to being behind. As a matter of fact, my Garmin says the race went 26.12 miles. I’m pretty sure the course markers were spot on and the Garmin was off. Anyways. when I do the recap of the marathon, I’ll make sure to get the official splits to display. After all, that’s what mattered most. The first 14 miles went pretty well for me. As I got to the half marathon point, I was at close to that 3:03:14 at the 14th split. This is pretty much what my half marathons have been. So, when I got to this point, I thought to myself that I was going pretty well. It was slow compared to my WDW Marathon and Chicago Marathon half mile times. However, I felt good about this split because it was on point with my training. Mile 16 (Split 17) is where the Queensboro Bridge is and that’s where my race could have ended. I was seriously ready to call it a day going up the bridge. What got me through that part was thinking about the story I wanted to tell my boy when he gets older about this race. Did I want to tell him that I gave in because it got too hard? Or did I want to tell him that I kept going? The latter is the story I wanted to tell him. Eventually the bridge does go downhill again and I recovered. On the other side of the Queensboro Bridge we arrived in Manhattan on 1st Avenue. When you’re running in the back of the pack, this is how the crowd looks. Earlier in the day, there is thunderous applause in this part. Even though I didn’t get that, I was still impressed with how many were still there…still cheering us on. At the mile 19 marker, I thought I was done running for the day. It was awesome to see the mile 20 marker! All I could think was how much I wanted to make it across the last bridge of the race before anyone pushed me up on the sidewalks (that what they do if you’re going too slow). On the other side of this bridge, I thought I’d try running again. Guess what? It wasn’t too bad. So, I found myself in mile 22 getting back into my run/walk intervals! I carried the intervals all the way into mile 26. By then, I realized that I wasn’t going to beat Chicago, but I’d finish ahead of my Los Angels Marathon time. So, I got rid of the poncho, the Gator Aide that I had with me and anything that might weigh me down. Y’all, there are no words for how the last mile went. I was blown away at how many people were still out cheering us on. The race MC’s were doing everything they could to keep us runners going. In that final mile, I heard one Race MC say, “Runners, you’re in the last mile! Take in EVERY moment! This is what you have trained so long for! Enjoy every minute of this last mile!” That’s exactly what I did. 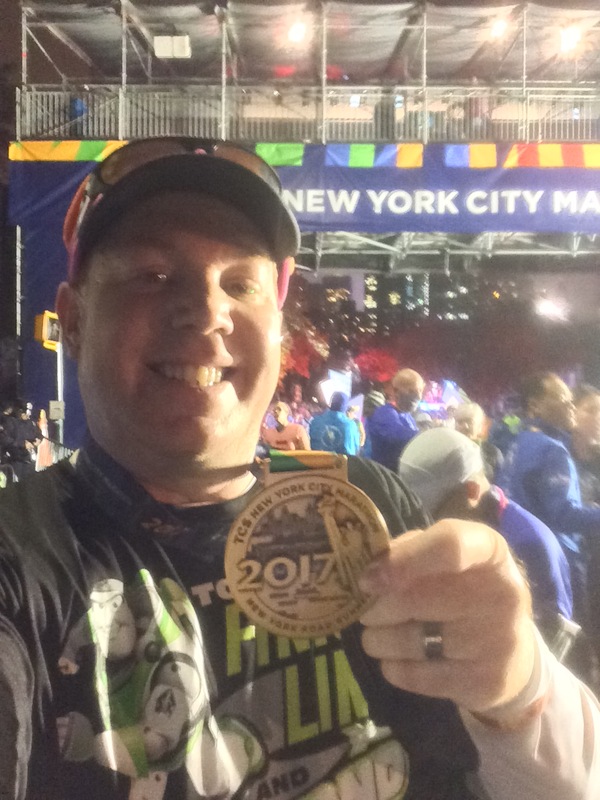 At the end of this week, I was a finisher of the 2017 TCS NYC Marathon! 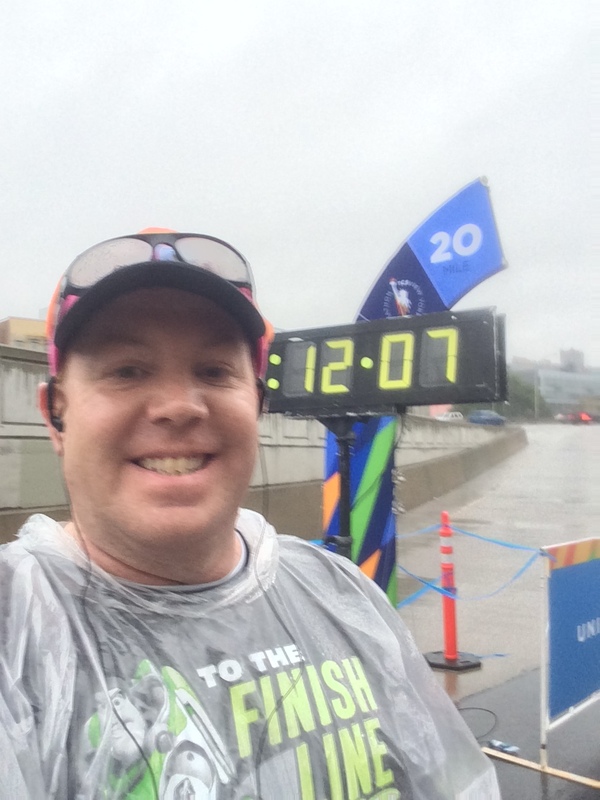 For the 4th time in my life, I finished a full marathon! 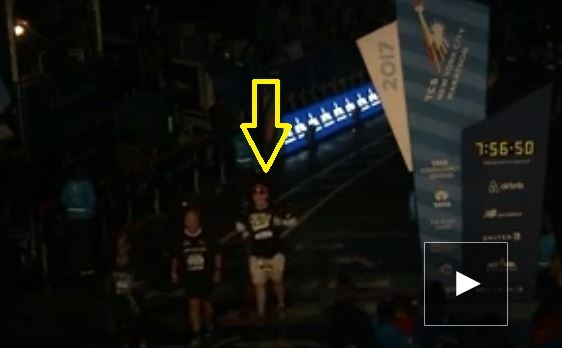 It was my 2nd World Major Marathon. As I type this, it still seems a bit unreal. 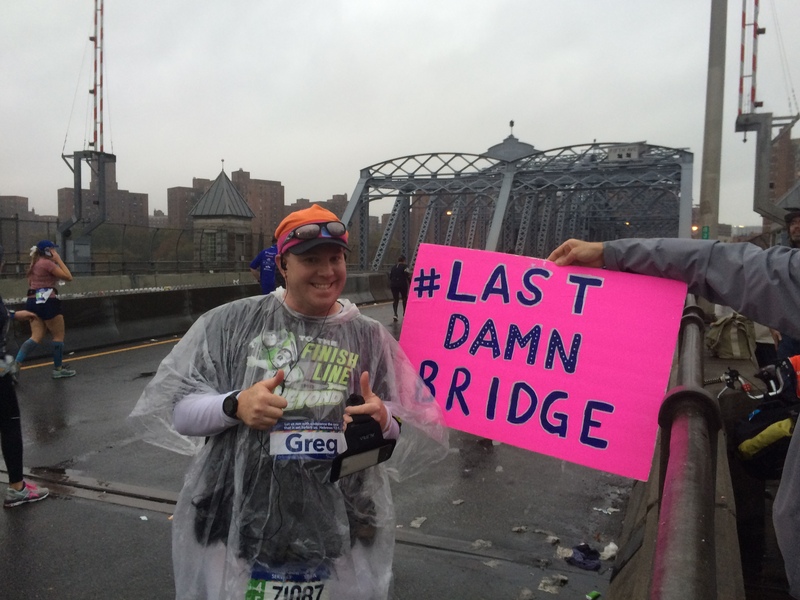 Some of my initial thoughts on the NYC Marathon…. I am seriously BLOWN AWAY by the support us back of the packers received on this marathon!!!!!! All 5 Burroughs supported us so much throughout the day. Going through Brooklyn felt like one GIANT party! However, as amazing as those folks from Brooklyn were, it was those last miles going through Manhattan that blew my mind. In Chicago, those last few miles saw a scant few people cheering us on. Not so in NYC. The music was blaring, spectators were dancing and cheering us on all the way to the finish! 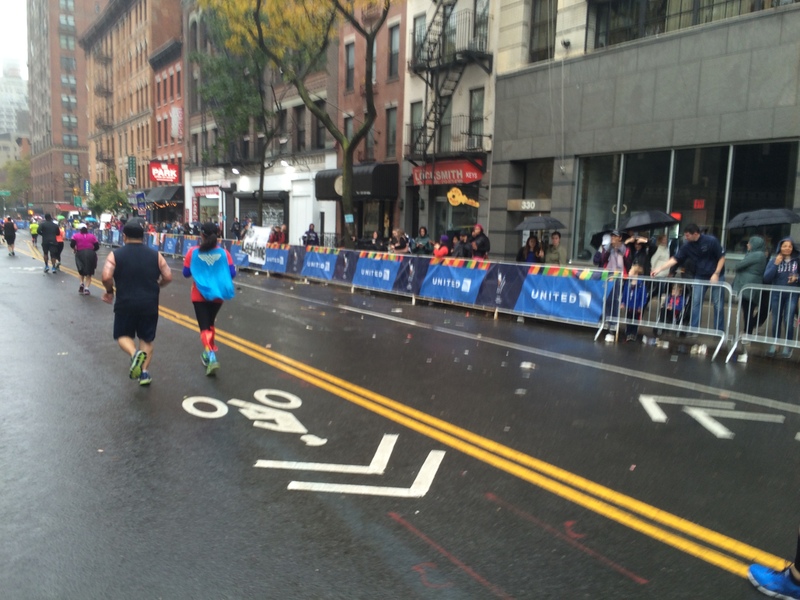 The NYC Marathon course is more difficult than the Chicago Marathon! Another thing that surprised me is that I was able to run the ENTIRE marathon WITHOUT music. I had my ear buds in, but never needed them. If you would have told me that I would be running an entire marathon without listening to my music, I would have told you that you’re crazy. However, that’s how it went down. 26.2 miles and I didn’t listen to a second of my own music. There was plenty of music on course. However, there were also stretches without music. So, I’m not sure how it happened. But, I finished the race without listening to any music. If you run this race, don’t check a bag. Go with the poncho option. The walk to get out of the runner’s area is long enough to get those ponchos that I can’t imagine having to go further. Plus, the exit for the area for us poncho people is right across the street from a subway station….and runners get to ride the subway for free on marathon day! 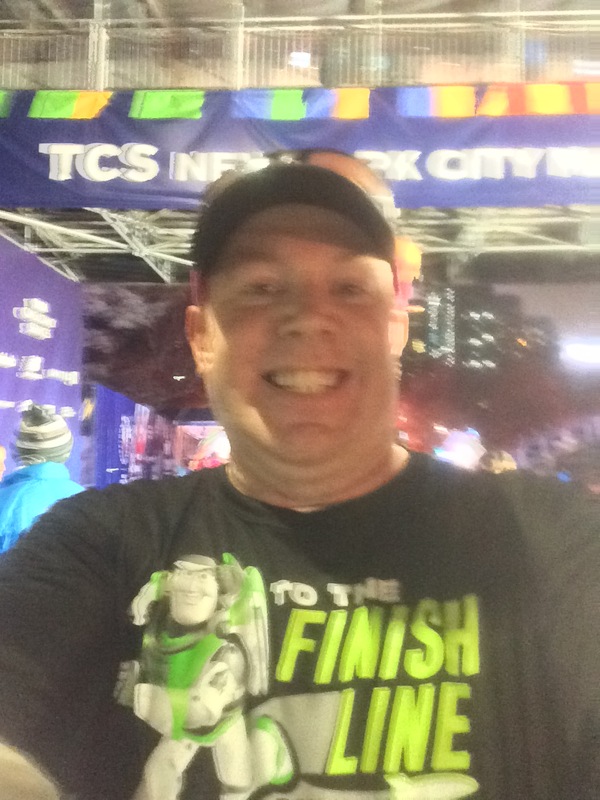 The TCS NYC Marathon totally lived up to the hype I’ve heard about it. If you’re a marathon runner, you need to run this race. It’s a great marathon! For me it’s a toss up between WDW (my first) and NYC as to which one is my favorite. I mean, the Disney fan in me makes it hard to go against WDW. But, the crowd support and larger than life vibe of NYC is also hard to beat. Can I call it a tie? 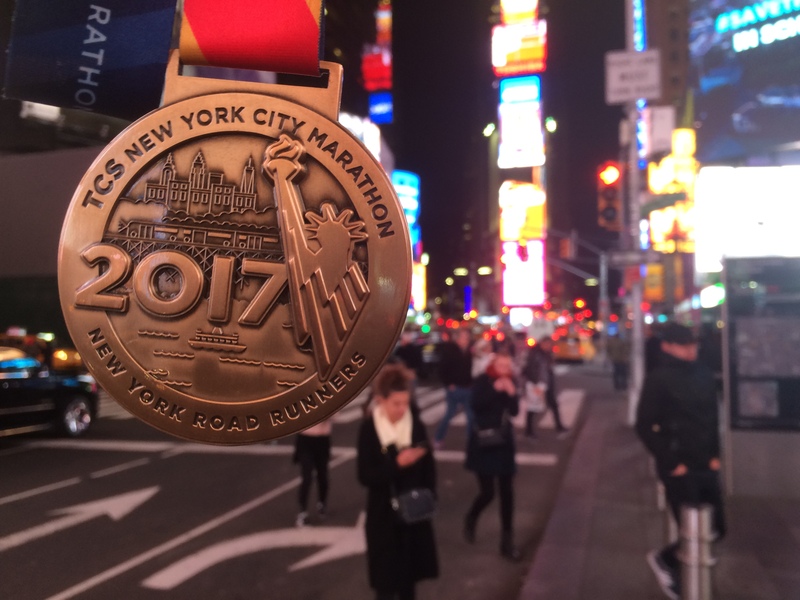 Not only does this blog post serve as a recap for NYC Marathon Week but for the week after as well. I took last week off and will take the next week off as well. I need the mental break from training right now. I’m going to try and get back at running the week after. However, I will only be running 3 miles for mid-week runs and 6 miles on the weekend ones for the rest of the year. In 2018, I’m starting a whole new chapter of my running career. I’d love to see this new chapter lead to running in the Boston Marathon as a Boston Qualifier in 2021. But, with such a lengthy goal, you never know what will happen. 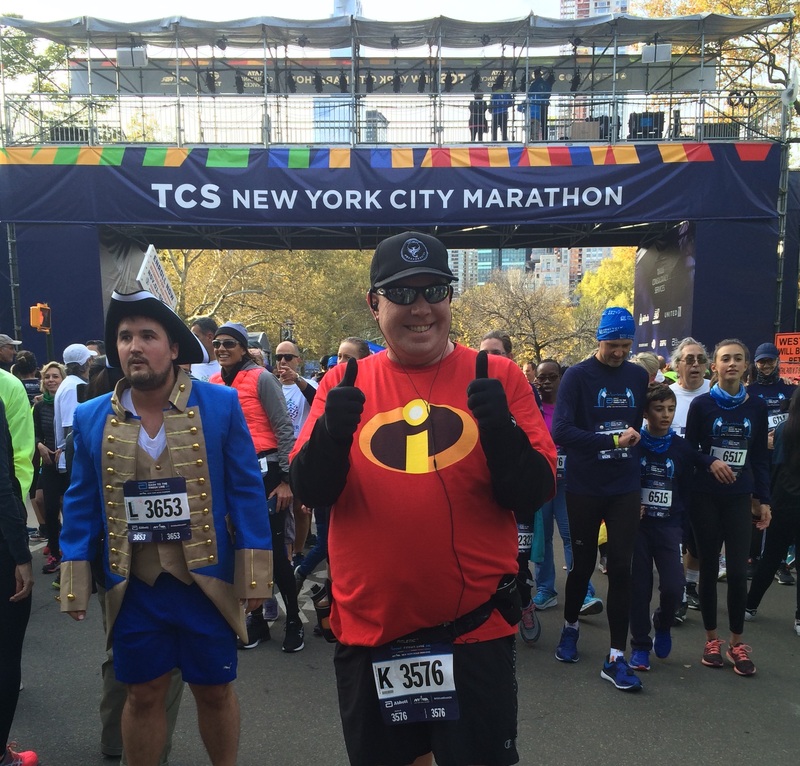 If the 2017 TCS NYC Marathon turns out to be my final full marathon, I will have no regrets. I gave this race what I could. As a running dad, it’s harder to stay dedicated to the training than before I became a dad. So, given all of that, I’m really happy with how this turned out…. Glad that you had a good experience with the marathon (I warned you about the Queensboro Bridge, it’s a killer) and NYC. great recap so far-cant wait to read your race review!